Before I say anything about this volume, let me tell you where I’m coming from. 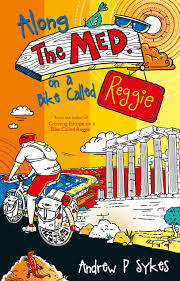 After more than 35 years of long distance cycling, and with a catalogue of adventure cycling books already read (and some abandoned after only the first chapters), I came to the reading of Andrew Sykes’sAlong the Med on a bike called Reggie with a certain hesitation…….indeed, I wasn’t sure about it. The cover suggested either the author was a menopausal male trying to catch up on missed opportunities in life, or he was one of those ‘born-again’ cyclists who may come across as a ‘fresh-faced cycling evangelical’. And I definitely wasn’t sure about the anthropomorphism of naming the bike……. but this clearly doesn’t rank alongside people who imagine dialogues with their bikes (yes, believe me, they do), or store their bikes in their bedrooms for reasons other than security.